If you are considering LASIK to correct your vision, don’t you owe it to yourself to find the best LASIK surgeon? Laser vision correction was first performed in the late 80’s and LASIK in 1990. It was FDA-approved in 1995 in the US. Over 60 million people around the world have had LASIK performed. Today, the procedure has never been safer or more precise. The days of vision “almost as good as glasses and contacts with mild difficulties with night-vision” are over. They have been replaced with most people having better vision than with their glasses and contacts. This includes better night vision and great-feeling eyes relieved of wearing contact lenses. Today LASIK is actually safer than wearing contact lenses! This has been accomplished through astonishing improvements in the software and hardware that drives about 50% of the procedure. The remainder depends on the LASIK surgeon and staff’s ability and experience. 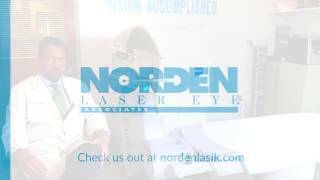 With over 30 years of experience in vision correction, Dr. Norden is one of the leading LASIK eye surgeons in the country. What a pleaseure to be able to fly and travel within Italy without glasses or contact lenses! Thank you Dr. Norden — ten years and counting! The great science fiction writer Arthur C. Clarke once observed that any technology, sufficiently advanced, is indistinguishable from magic. I’d like to thank Dr. Richard Norden, magician, for ridding me once and for all from eyeglasses, contacts, reading glasses, et al. For the first time in my life I can drive, read and see where I’m going without mechanical assistance of any kind. It still seems miraculous! My wife and friends were absolutely correct when they said Lasik was a life changing procedure and that you were a fantastic doctor. I could not be happier with the process, the procedure and, most importantly, the result! From beginning to end, you were the consummate gentleman and professional. It truly was a pleasure doing business with you and your team of world class professionals. 11 years later and still no complaints. This was without a doubt the best decision I have ever made. Being able to see without the help of glasses or contacts is truly a blessing. Thank you for returning to me the gift of sight. As a professional football player, I’ve always had to have the very best medical care; it’s saved my life. 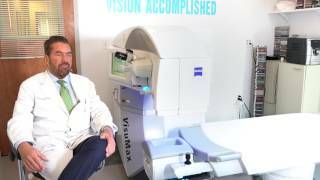 When it came time for my wife, Danielle, to have LASIK, we did the research to find the very best and one name kept coming to the forefront, Dr. Richard Norden. Dr. Norden did Danielle’s LASIK and he and his staff took wonderful care of her and she now sees so well, maybe better than I do! Thanks for all the great care and the results! 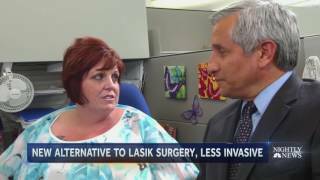 Wondering if you can afford LASIK surgery?